Some of the regular readers of this blog might take a look at this cover and say....what? My first love has always been mystery/thriller with some fantasy and general fiction thrown in. Sometimes I take a step away for something entirely different. Elizabeth Vaughan's first book in the Chronicles of the Warlands way back in 2005, Warprize, was well reviewed everywhere. I gave it a spin and promptly fell in love with the world of the Warlands, and and the wonderful characters inhabiting it. Lara, Princess of Xy and master healer; and Keir, Warlord of the Plains are simply unforgettable.They go from a place of total personal and cultural misunderstanding to a partnership of strength and love, each hoping to blend two very different cultures for the benefit of both.The next three volumes, Warsworn, Warlord, and Warcry, see them enduring great success and failure. Vaughan then published the three volume Epic of Palins, set in the same world, but in a different place and culture. I enjoyed all three but never felt a connection as intense as in the first four books. The last volume of the Epic of Palins was published back in 2010 and nothing has been heard from Vaughan since. So when I was offered an ARC of a new book (yay!) in the Chronicles of the Warlands I was delighted, to say the least. 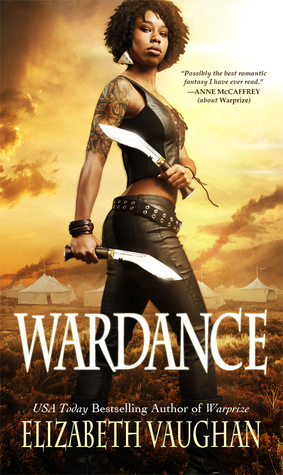 Wardance takes place immediately after the events of Warcry and centers on Simus of the Hawk, one of the most memorable of the Plains warriors. Simus is Keir's "second"; arrogant, impulsive, bigger than life, and full of joie de vivre. He is completely loyal to Keir and has traveled back to the "Heart of the Plains" for the annual challenges in order to reach Warlord status himself. Upon arrival, he and his men are stopped by the hated warrior priests of the Plains. They are not allowed to proceed to the Heart and on that first night, amazed to see a pillar of bright light and sound reaching to the heavens. What are the warrior priests up to this time? Nothing good, as usual. When Snowfall, a warrior priestess, challenges to become "token-bearer" to Simus, a position of trust, she is met with nothing but suspicion. But the two have an undeniable and growing attraction. 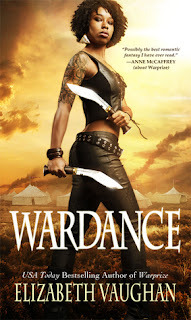 I do not recommend reading Wardance as a stand-alone. Each book builds on the one before and even The Epic of Palins has elements that play into the plot. That being said, I just did a binge re-read of the first four, and am starting on the Epic re-read. I have to say that I enjoyed re-reading them as much as the first time around. Vaughan's novels are high adventure and romance, built in a fascinating world of conflict with plenty of swordplay and unforgettable characters. Lara and her Warlord, Keir, make only brief appearances, but I am looking forward to much more. Oh, and there are dragons too! Thanks so much to the author for bringing back The Chronicles of the Warlands and for an advance copy. The opinions above are my own. Was Damien Mosley Edited Out?